I don’t know how long I’ve been in love with Chubby pipes, but my awareness (so to speak) first dawned when Luca di Piazza teamed up with Luigi Radice several years ago and began releasing the Neatpipes/Radice Chubby Billiard. In the years since, Luca and Luigi have issued a number of chubby shapes, and several of the Italian artisans represented by Luca at his Neatpipes boutique have offered their own versions. Anyway, if you’re both a Pete Nut and a Chubby fan, it won’t come as a surprise that Peterson and Chubby go together like Laurel and Hardy, Gilbert and Sullivan, or Sherlock and Watson. We talk quite a bit about the Peterson aesthetic in the book, so I won’t say more here. 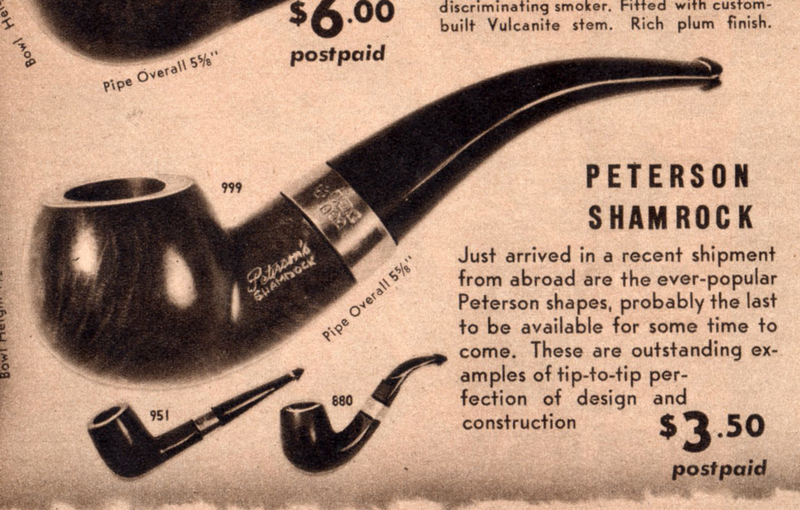 I don’t know when the word was first used in the larger world of pipe ephemera, but K&P first used the word “Chubby” in their 1947 shape chart to describe shape 119, a “Chubby Billiard.” But this isn’t the shape most Pete Nuts think of when they think Peterson Chubby. Current pride of place has to go, I think, to the long-unavailable original shape 999, which Peterson always called a “John Bull”—not a Rhodesian. The first appearance I’ve been able to track for it in the K&P ephemera is in the 1935 “A Chat With the Smoker” pipe-box brochure. It next appears in the Peterson ephemera on p. 13 of the George Yale catalog for the summer of 1942, this time in the U.S.-only Rogers Imports initial Shamrock release, strikingly without its double-bead and without a P-Lip. It’s really more of a chubby quarter-bent apple, I suppose, in this strange rendition. 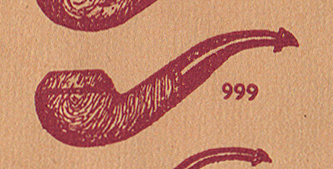 In 1945, the 999 appears in the K&P “Red” catalog, adorned with its double-bead and P-Lip, as part of both the high-grade Deluxe and Dublin & London lines, as well as being available in the lower Kapet (no band) & Kapruf (sandblast, no band) lines. Around 1977, as seen in the Associated Imports Distributor’s Catalog illustrations above, the John Bull 999 became the XL999, and Peterson introduced shape 998, a stream-lined version of the 999 The two shapes ran alongside one another for several years, which happens when shapes are in transition. The XL999 / 999 Large John Bull was still in the 1987 catalog, but by the 1992 Handmade Brochure it had morphed into the slimmer 998 shape, which number was henceforth deleted from the catalog. I might add it was still called the “John Bull,” and Pete Nuts worthy of the name should educate all comers that while others may call the shape a bent Rhodesian, we know better. If you’re looking for an original John Bull, you should be aware that photos of the old 999 on ebay make it appear larger than it actually is. It’s really within the parameters of most pipes of its day, with a chamber size of (approximately) 0.7 x 1.3 in. (that’s 17.78 x 33.24 mm) and comes in at just under 5 ½ inches, weighing 2 oz (that’s 56 gr). 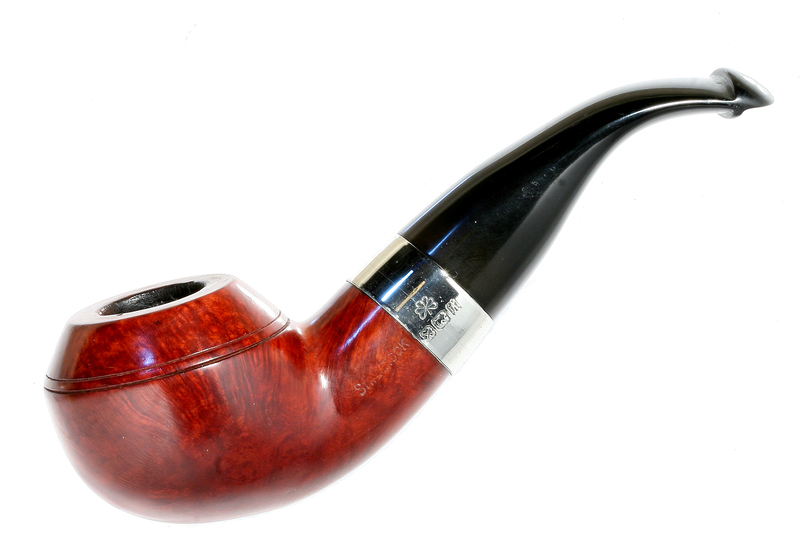 Peterson estates remain great bargains on the pipe market today, even though a shape like the John Bull 999, which seems to have become a bit of a cult item, can sometimes go for a bit more. Recent DIY specimens (that is, needing restoration) went on ebay for $55 and $132—the $55 dollar being a Sterling Silver Line with fantastic wood and the $132 being a Shamrock! 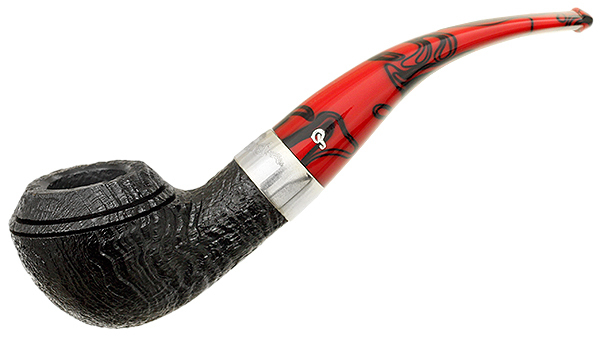 Incidentally, Sykes Wilford at Smokingpipes.com says the 999 is his best-selling Peterson shape. * For more on Chubbies, see my article “Built for Comfort: A Short History of the Chubby Style ,” at http://www.neatpipes.com/blog/built-for-comfort-a-short-history-of-the-chubby-style/&id=7 . The ONE at the top of this page – I’ve been looking for one THAT FAT since we had one come into the Tinderbox (for repair) somewhere between ’79 and ’89- I WISH I could have talked that guy out of that one – gosh knows how old it was! Why don’t you convince Mr. Palmer for Peterson to start making ’em like that?! 999-10! It’s the Real Bull, no? This blog post and more comments might just bring your wish to Peterson’s attention. It was partly my fault (according to Tom Palmer) that the Founder’s Edition was an Oom-Paul. And we can blame the late, great Chuck Wright and myself for asking for (and getting) the “Kaffir” and the “Jap.” And two years ago I began whining about the “Pat,” which appeared as 2014’s Antique Collection. So it can happen! We just need raise the roof beams a little more. Thanks for the article on one of my favorite shapes! I have many fat old examples from Shamrock to Sterling and DeLuxe series. I am a proud cult member! Can’t wait for part 2. Thanks, Lone Star. Your encouragement, as always, is much appreciated. I need a signed copy of the book when it’s out, please! No problem! We’re slogging our way through the 2nd draft. Yikes. Who woulda thought footnotes could be so much FUN?!! Mark, thanks for the article. The chubbies are my favorite shape and I too have several. And I just ordered a smooth one like your picture from the George Yale catalog on a Buy it Now the other day. After I ordered it I spoke with the seller and he confirmed my suspicion that it was pre-republic with Made in Ireland in a circle. I can’t wait to get that bad boyin my hands. Please delete and disregard my previous post here. The 999 that I bought was not the smooth pre -republic. I don’t need any help I can make a fool of myself all on my own. This has to be my all time favourite shape Mark. Thanks for the write up. Thanks Mark. I just picked up an XL999 Kildare, so it was nice to be able to date it to an era. I’ll be doing a Reborn blog entry on it shortly and reference this article.